Colorado Special Supplemental Nutrition Program for Women, Infants, and Children’s (WIC) Farm to Family program, now in its third year, has eight farmers in six local agencies across the state authorized to accept WIC produce checks. WIC participants now can purchase WIC-approved fresh produce direct from the farm. Apples, grapes, peaches, broccoli and carrots are among the offerings on an extensive list of eligible produce. 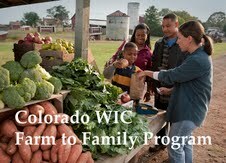 Information about Colorado WIC's Farm to Family program, including a map of eligible farm stands, is on the Colorado WIC website at www.ColoradoWIC.com . Click on the Farmers tab on the left side of the page. WIC clients receive WIC checks for fruits and vegetables. They can shop for their produce at any WIC-authorized retailer, farmer’s market or roadside stand. Farmers must apply and meet a set of selection criteria, which includes growing and offering produce that meets federal nutrient requirements. WIC is an important nutrition program providing benefits of more than $60 million per year to approximately 100,000 women, infants, and children in Colorado.